L: 53" x W: 20.5" x H: 28.5"
Colby 53" TV Console w/ Electric Fireplace Create plenty of ambience in your entertainment area with this Colby 53" TV console. Metal accents, ash veneers and a silver charcoal finish make this piece truly beautiful. It also includes an electric fireplace with adjustable heat to keep you warm and toasty when it's cold outside. Plus, you can turn off the heat entirely for use every season. Create plenty of ambience in your entertainment area with this Colby 53" TV console. Metal accents, ash veneers and a silver charcoal finish make this piece truly beautiful. It also includes an electric fireplace with adjustable heat to keep you warm and toasty when it's cold outside. Plus, you can turn off the heat entirely for use every season. Maximum size: fits most flat-panel TVs up to 55" (guideline only; please make sure to measure your TV's width to ensure it fits). Warms an area up to 1,000 sq. ft. while automatically adjusting fan speed and heater wattage to reduce energy output. The fireplace can also be used without heat for year-round enjoyment. Please be advised that our delivery team is unable to install your TV on this console. This product is absolutely beautiful! The darkened glass is classy looking. The wood is beautiful and sturdy. I have a DVD/VCR combo, Blue-ray player and Cable box on the top "shelf". I wish I would have known how many dvd's it would hold before buying it but was SO happy to know it holds more than I own! The way I have them arranged, this will hold about 200 DVD/Blu-ray's. The heat is great. It allows you to lower or higher the heat. The colors are beautiful and what a great glow from the crystals. It is a great edition to my living room! Was lookn at other fireplaces at 1st,then i saw the colby. Was totally sold on it,i keep lookn at others just to see if before i made my choice and i am so glad i bought it,when you buy what you want instead of settling for something that's "nice" it looks even better in your house.This fireplace looks Right! Especially with the glass look,i am so pleased! Nice piece of furniture and is well made. The measurements are not showing in description – Fireplace insert in middle is 26” wide by 19” high. The glass doors on either side are 13” wide by 18-1/2” high. The shelf inside the glass doors is 12” wide by 15” deep on each side. The unit (including the 3-1/2” space between base and glass shelf on top) is a little over 27-1/2 high. Wish I would have been given the correct measurements (I purchased this over the phone from seeing it on the website). I have stereo pieces that are too wide to fit in the shelves on the side (which is what I wanted) and they are too high to fit in the 3-1/2” space between unit and glass shelf – so all of the pieces (4) are now on top of the glass. Not exactly the look I was going for, but it works. 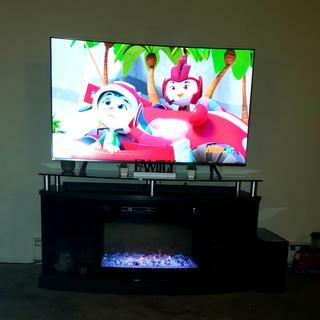 I am very pleased with the quality and look of this unit – you can change crystal colors by using the remote, I haven’t discovered how to get all the colors they say you can get and if you want the sound of flickering flames – there isn’t any sound. Perfect size for our living room. All TV equipment fit in nicely with room to spare..and the fireplace is beautiful, so soothing to just sit and watch! Great piece of furniture and perfect accent to a living room. I was happy to see all the pieces were included and that none of the wood was damaged as I have had bad experiences with other furniture stores in the not so distant past. I will not mention any names, but it rhymes with Bob's discount furniture. (Did I just say that out loud?) Oh well, like Bob's, I never get it right the first time (or 9th). Back to the fireplace. What's great about Raymour furniture is that it's all made to last. Each piece comes from quality wood as opposed to other places which use cheap, hollow wood which will definitively break in due time. Yes their furniture is more expensive. In this life you get what you pay for. My advice to perspective buyers is simple: save the extra money and buy a piece of furniture friom Raymour as you will not need to ever replace it because it will not break. So cool when lit, very modern looking. Enough space for A/V equipment and shelves for storage. All our friends love it too. This fireplace/tv stand is absolutely gorgeous. The variety of colors for the fireplace is what caught our eyes. It also warms up the room very quickly. This is by far the best piece of furniture in my living room. The quality is great and the functionality of the fire place is amazing. Truly a must buy item. I love it! Handsome piece compliments my bedroom set! Perfect match! It heats up my large bedroom! Awesome and just in time for cold weather! Love it! And it looks great too! Matches my bedroom. Love this console/fireplace. Fits perfect in our livingroom and the fireplace lit it beautiful. Nice and sturdy console that should last years. We added this to our drafty basement that we use as a play area for our children. They love looking at all the changing colors and it heats the room nicely. This product delivers as advertised. Dimplex Glass ember Fireplace provides colorful and modern look. The console provides good sized storage on either side of the fireplace. Visual treat to buyer with multiple fire colors from the fireplace. It has heater effect at the same time during cold season. Loved it. Master piece as media console????????????????. "It's a wonderful solid Console with Electric Fireplace"
I have been watching this Colby 53" TV Console with Fireplace for a long time. I have finally made it possible to bring it home. I really wanted it in our home due to the cold winter we have. Myself and 3 boys are excited about this unit. I can look out my window and see snow and then look at our Colby and smile. It is a great investment to our home and it looks beautiful with its multi color scheme. This is an elegant and eye-catching piece for any room. The fact that you can choose whether it heats or not is a good utility option. Remote is user-friendly. I love that you have so many color schemes to choose from. Sets the mood perfectly. I love this and it is so beautiful in my home I love to turn on the fire place and relax after a long day it match’s great with the Skye loveseat and couch ! Does not generate as much heat as portrayed by sales persons. It is nice to look at but I wish it was more functional. Can you get this piece with the "Real Logs" option instead of the glass crystals? BEST ANSWER: We stock the fireplace as pictured for immediate delivery. Other options are available to special order and can be handled exclusively through your local Raymour & Flanigan store. 1. I am assuming that the height is 28.5"? 2. Since the glass top is curved, what is the width of the smallest and largest part of the glass top? BEST ANSWER: The height of the Colby 53" TV Console w/ Electric Fireplace is 28.5". The glass top measures 52" L X 16" at the ends of the console. At the mid point the glass measures 20 1/4" W. Also, the opening beneath the glass top measures 3 1/2" high. I miss placed the owner's manual how can I find get one ? BEST ANSWER: A reply has been sent directly to your personal email address. Please contact Online Sales at 866-383-4484, option 3 for additional product details. does this model come in another wood finish (mocha) instead of the silver black? BEST ANSWER: The Colby 53" TV Console w / Electric Fireplace only come in the wood finish as shown on our Website. 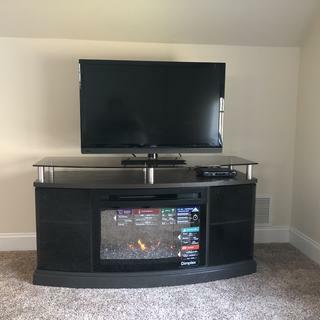 can you put a tv on the silver part on top or does the tv have to be wall mounted? BEST ANSWER: The Colby 53" TV Console w/ Electric Fireplace has a maximum weight capacity of 75 lbs. It is made to support most televisions at and below the 55" range. Does this come in 59'? BEST ANSWER: The Colby TV Console w/Electric Fireplace is available at 53" only. The website says that the color is “Silver Charcoal” yet I saw it in the showroom today and the sales rep said it is Expresso (maybe it was the light but it does look to have brown in it). What is the true color? BEST ANSWER: Hello Sandra! The Colby 53" TV Console has a dark grayish brown finish. We do our best to photograph the furniture to look as true to life as possible, however differences in computer monitor settings and lighting can sometimes make it difficult to determine the actual color. Thank you for your response! Just as I thought but I would suggest that you update the website description (silver charcoal) to reflect the true color. You're welcome! I hope that helps. Our product team will discuss on updating the finish color for this piece. Thank you and happy shopping! 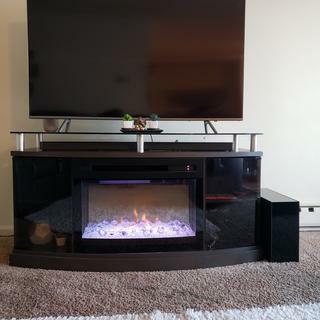 Do you have this colby 53" console w/ electric fireplace in a bigger size, like 70"? BEST ANSWER: Hello Roxanne, we do not offer a larger size console for the Colby. Do you have the option of not having the fireplace insert? BEST ANSWER: Yes. Purchasing the TV console without the firebox would be an order option. You can order this by visting your local showroom or contacting our online sales department, 866.383.4484, option 3. We would be happy to assist you! I absolutely love this item. I would like to know if it can be ordered wider,i.e.,65" ? BEST ANSWER: The Colby TV Console w/ Electric Fireplace comes in only one size - 53". What are dimensions of firebox? BEST ANSWER: The dimensions of the firebox are 26.25" L X 10.25" W X 19" H.